Esmeralda Santiago, Negi, had no idea how hard her childhood would be. With constant moving around and the nonstop bickering of her parents, it was tough for Negi to find her identity. A move to the big city changed her life forever. 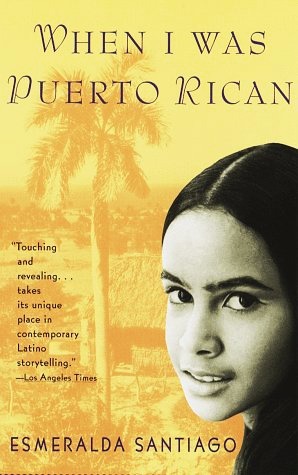 The author of When I was Puerto Rican writes about finally finding her identity. When Negi was a young girl, she lived in a tin house in Macún, Puerto Rico. Her family moved around a great deal because of her father’s unsteady job and her parents constant bickering. They moved to Santurce, a suburb of San Juan, several times. During this time her mother was pregnant numerous times. Being the oldest, Negi was frequently called upon to watch the children and take responsibility for them. Negi goes to spend time with her grandmother, whom she didn’t know well. While with her grandmother, Negi learned to crochet, and she is also taken to church for the first time. She was glad to go home with her mother because she became homesick. Once she returned home ,an enormous hurricane swept through Macún and destroyed their electricity and caused some structural damages to their house. Because of the hurricane, Negi’s mother is forced to get a job to pay for the damages, and Negi is left to watch after the children. The children don’t listen to Negi ,and as a result her youngest brother Raymond gets his foot caught in a bike chain. Their mother is obligated to quit her job to care for Raymond. Negi's mother travels to New York a few times to see a specialist about Raymond's foot. After traveling to New York, Negi's mother decided there would be more opportunities for her family there. Only three of the children left with Mami: Negi, Raymond, and Edna. The other children were to stay in Puerto Rico with Papi until there was enough money to fly them to New York. Negi loved the first house they lived in. It had an extravagant painting of angels on the ceiling. When she started school in New York, the administration wanted to place her in the seventh grade because she didn't know English. She argued and worked her way in to the lowest class of eighth graders. They moved into a new house ,and the other children came to live with them. Mami fell in love with a man named Francisco the first winter they lived in New York. The following summer was the summer Marilyn Monroe died. They moved to the Projects with Francisco. Francisco soon found out that he had cancer at the same time Mami became pregnant once again. Francisco spent many days in the hospital, but he could not fight off the cancer and died. Negi decided she wanted to be on television. She tried out for the Performing Arts School. She thought her interview went horrible, but she was accepted. She went on to graduate the Performing Arts School and later attended Harvard where she graduated with highest honors. This page was last modified on 17 January 2018, at 23:23.